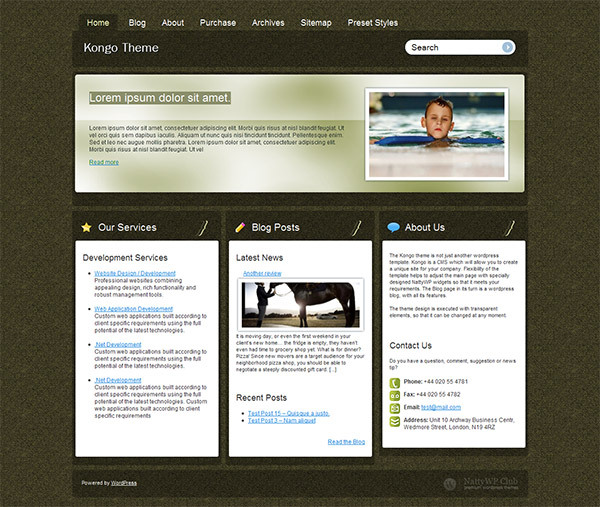 The Kongo theme is not just another wordpress template, it is a CMS which will allow you to create a stylish and unique business-oriented site for your company. The serious flexibility of the template helps you adjust the main page with specially designed widgets, so that it meets all your specific requirements. The Blog page in its turn is a wordpress blog, with all its features in order not only to present your business, but also to communicate trough the company blog with your current and future customers. The Kongo theme offers a featured news slider that lets you display the most important information on the main page of your site. You can rotate the most important articles on the main page of your site. You can create a special featured category and choose the number of news to be displayed. An About Us widget was specially developed for this CMS theme. It helps to give a general idea about your company, its activities, and also leave all the contacts. You can use html tags and this lets you highlight text, insert pictures etc. A Recent posts widget was developed for the CMS theme to let you announce latest news and also related posts underneath. Thanks to layout transparency you will be able to create as many variations of colors as you wish and you get by default 9 different color schemes to choose from.